Whatever about being sensible with your own sun-exposure, it’s vital that you protect your children from the harsh rays. Their skin is delicate, sensitive and more prone to burning and heat rashes. Little bodies are unaccustomed to the intensity of hot weather and can easily suffer heat stroke if they’re left out in the sun too long. Not to mention the fact that too much sunlight in childhood has been linked to skin cancer in later life. But you don’t need to do anything drastic like cancelling the family holiday. Far from it. All it takes is some precautionary measures to ensure you and your child have fun in the sun. A child’s skin is far more light-sensitive than adult skin. So even if your baby is naturally quite olive-toned, you should use a very high-factor sun cream. 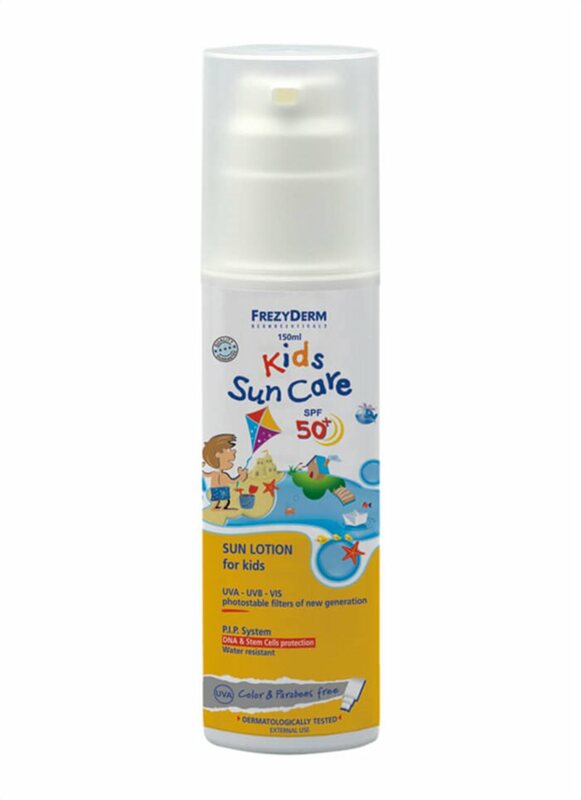 You need a broad-spectrum sun cream that forms a barrier against both UVA and UVB rays. 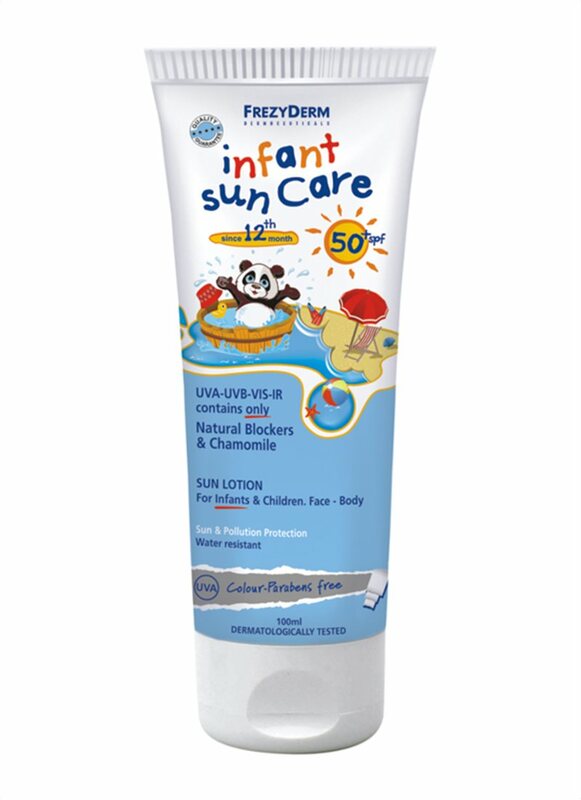 Opt for a factor 50 sun cream like our Infant Sun Care SPF 50+ and apply it liberally all over your child’s skin. Make sure to regularly re-apply it throughout the day – especially if they’ve gone swimming. Sun exposure should be kept to a minimum for children under 6 months old. They are particularly susceptible to burning during the hours of 11am and 3pm when the sun is at its hottest. If going out in the sun is unavoidable, make sure they are wearing the correct SPF and loose-fitting clothing. Older babies and toddlers will want to play outside when it’s sunny, and this is fine as long as they are kitted out appropriately and seek shade when the sun is hottest. Popping a hat on your child’s head serves a number of functions. It helps prevent the crown of their head – which has sparse hair – from burning. It helps to stop the over-heating which can lead to sun stroke. It keeps their little faces in the shade. Opt for a wide-brimmed and floppy cotton hat. Any sunglasses you choose for your child should meet the British standard. Look out for the CE mark which indicates the glasses carry UV ray protection. Sunglasses should always be worn by your child when they are out and about in summer weather. Water reflects the sun, doubling its intensity. So, if your child is playing in the pool or the sea, make sure to protect little necks and torsos by popping a baggy tee over their swimwear. Because we get most of our vitamin D from sunlight and very young babies ought to be kept out of direct sunlight, it’s worth considering a vitamin D supplement. This will help prevent any deficiencies occurring in the time before they can go out in the sun. 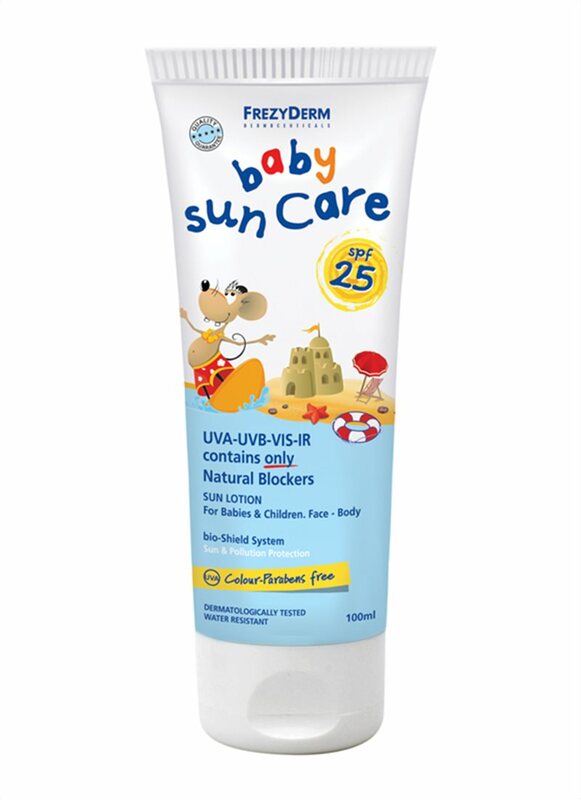 Our baby sun creams are specially formulated with young, sensitive skin in mind.